About midway through “WET: A DACAmented Journey,’’ Alex Alpharaoh vividly recounts and reenacts the harrowing, life-or-death journey taken in 1983 from Guatemala to the southern border of the United States by his then-15-year-old mother, Lucrecia Cividanis, clutching baby Alex. It’s a moving portrait of a small family’s desperation, leavened by a stranger’s kindness: When Alex begins to convulse, a woman who had recently given birth but had left her own baby back home takes the infant from his terrified young mother and feeds him from her own breast. However, starvation was far from the last challenge that would be faced by mother and child — including, decades later, Alpharaoh’s fight to remain in the only country he had ever known. 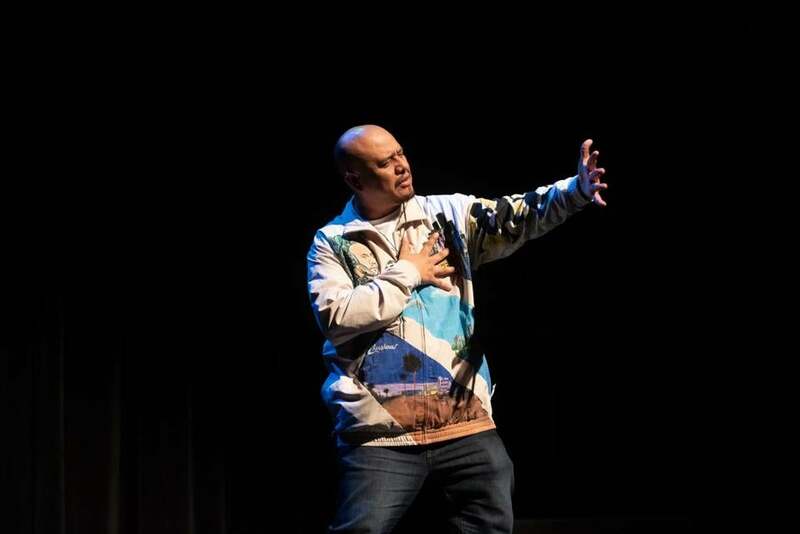 His solo show, “WET,’’ which is slated to run through Nov. 25 at the Emerson Paramount Center, is steeped in the particulars not just of Alpharaoh’s autobiography but of the immigrant experience more broadly. Directed by Brisa Areli Muñoz, “WET’’ underscores the precarious existence endured by those who, like Alpharaoh, rely on the DACA status that President Trump has tried to rescind. At times the level of immersive detail in “WET,’’ especially regarding Alpharaoh’s bumpy and frustrating travels through the bureaucratic maze, has the effect of slowing down the momentum of his tale. But more often Alpharaoh’s insistence on leaving nothing out adds force to his narrative; the accretion of seemingly random cause-and-effect episodes reminds you how the wayward toppling of dominoes can upend an immigrant’s life. A performance artist from Los Angeles, Alpharaoh is a passionately expressive performer, and in “WET,’’ which he wrote, he draws upon one of the signal strengths that live theater possesses: an up-close intimacy between storyteller and audience that enables us to walk — or at least imagine walking — in the shoes of another. On the available evidence, it appears that this kind of imaginative empathy and identification is a capacity singularly lacking in Donald J. Trump. (Alpharaoh does not speak Trump’s name in the show, referring to him only as “the 45th.’’). As the show’s title suggests, Alpharaoh is one of the estimated 800,000 “dreamers’’ covered by the Deferred Action for Childhood Arrivals program, known as DACA. It was introduced six years ago by President Obama to protect from deportation people who were brought illegally into the United States when they were children. A little over a year ago, President Trump announced plans to end DACA. However, the Trump administration’s desire to rescind DACA so far has been blocked by the courts. But the threat to DACA galvanized Alpharaoh to undertake dramatic steps toward becoming a legal resident, a story that takes up roughly the convoluted but suspenseful second half of “WET.’’ He left the country on a trip to Guatemala on what is labeled “advance parole,’’ planning to return to the US as part of the process of establishing an official point of entry, which creates the possibility of attaining legal status. But there was no guarantee he would be readmitted to the US, raising the distinct possibility Alpharaoh could be separated from his daughter. To judge by their demonizing rhetoric about undocumented immigrants, Trump and other members of his administration want us to forget that there are human beings at the center of the ongoing debate about immigration policy. “WET’’ doesn’t let you forget. Whatever your views on immigration, part of the considerable value of this production is that Alpharaoh’s vivid personal testimony forces you to think in specifics, rather than faceless abstraction, about the aspirations, dreams, and individual ordeals of the people who are being so cavalierly used as political footballs.